Internally this wire mesh locker has two coat hooks to hang garments and a top shelf to store items. Offers visibility while maintaining security. Manufactured from 25 x 25 x 2.5 welded mesh on 8mm rod frame. Our wire mesh lockers are electroplated in a bright zinc finish. Full height lockers are 1980mm high. All mesh lockers have fixing brackets which can be fixed to the wall, to the floor and back to back. Available in singles and nests of 2 and 3. Single tier mesh lockers come complete with hat shelf and coat hook or rail. 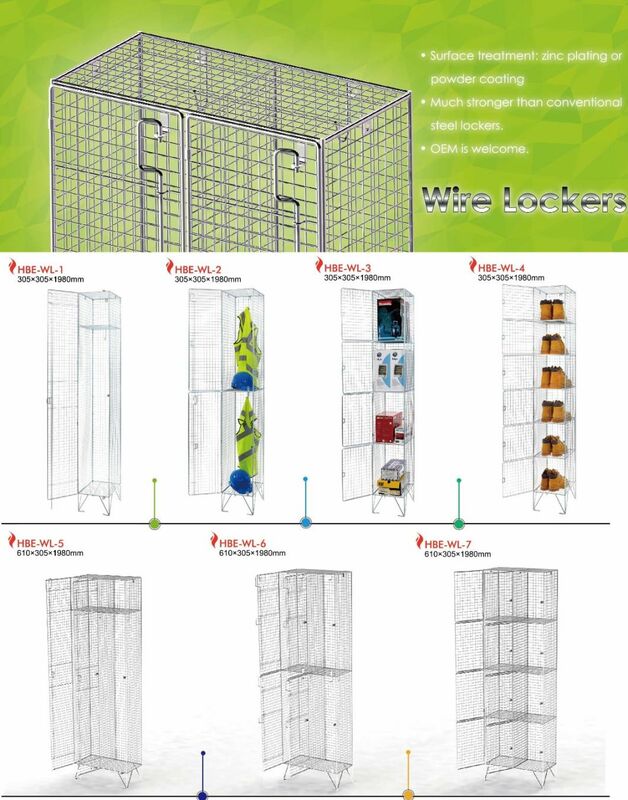 Two tier mesh lockers come complete with coat hook or rail. No internal fittings for the 4 and 6 tier lockers. Available with 1, 2, 3, 4, 5 and 6 doors. Available in a choice of three depths; 305mm, 381mm and 450mm. * Made of high quality wire mesh. * With screw-free and knock-down structure. * With adjustable shleves or hangers. * Different styles of handles available. * Various colors avaliable according to RAL samples. * We provide OEM and ODM services, all products can be made to your request, please contact us by live chat or email for further coorperation.